If the Yellowstone Caldera ever erupted, the consequences would be devastating. Having last erupted over 70,000 years ago, the Caldera, a bowl-shaped structure formed by previous evacuation of lava, could be a ticking time bomb. “Ticking,” in this case, is relative. We have no way of knowing when Yellowstone will erupt again, but scientists don’t believe it to be an imminent threat, at least not in our lifetimes. That’s not stopping NASA from putting a plan together to ensure the threat posed by Yellowstone never comes to fruition. Based on previous eruptions, we could assume lava won’t be much of an issue — it never travelled far outside the park boundaries, according to the United States Geological Survey. Ash, however, would create a far-flung cloud that could eat up as much as 800 kilometers (500 miles) surrounding Yellowstone. As the dust begins to fall, wind could leave all of the West, and areas of the Midwest as far east as Chicago, covered in up to 10 centimeters (4 inches) of soot — not exactly inviting for crop growth in the region responsible for a bulk of our food supply. Ash clouds will also emit vast quantities of gas, mostly sulfur dioxide. These gases would then create an absorbent layer that catches sunlight and reflects much of it back into space — leading to a cooling effect lasting several decades. Again, there’s not much reason to fear. Scientists give this a minuscule chance of happening in the next 100 years. But just in case, NASA has a solution that could keep it from happening at all. First, teams would drill in from both sides of the volcano, outside the boundaries of Yellowstone National Park. Drilling directly down through the center of it would be dangerous, both due to heat and the instability caused by poking holes into the heart of an active volcano. From there, water would be pumped into one side, and back out of the other at high pressure. The exiting water would reach temperatures of around 350 degrees. The water going in would cool the volcano. Upon exiting the other side, the hot water would generate steam, which could be used to provide electricity to surrounding residents. You would have to give the geothermal companies incentives to drill somewhat deeper and use hotter water than they usually would, but you would pay back your initial investment and get electricity which can power the surrounding area for a period of potentially tens of thousands of years. And the long-term benefit is that you prevent a future supervolcano eruption which would devastate humanity. 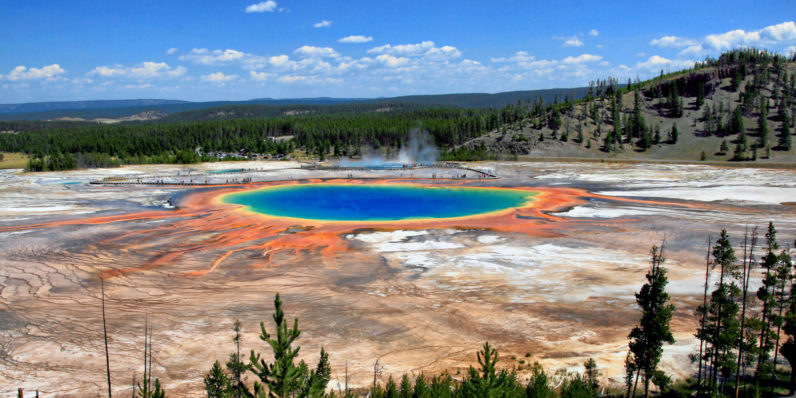 If successful, NASA’s method would cool Yellowstone at an estimated rate of a meter (3.2 feet) per year. At that rate, it would take thousands of years to cool the Caldera sufficiently, and even longer to ensure it was no longer under active threat of eruption. Unfortunately, it would eat up an estimated $3.46 billion for an organization whose budget just keeps getting slashed. Still though, it’s a plan. And if all else fails, it seems like a solid script for a cheesy summer action flick.